A few years ago I shared the story of one small investment of a beginner income investor I met at the beginning of my own dividend journey. This story shows that anyone can start learning investing, no matter what age, level of money they can set aside. All that truly matters is having the right attitude that you can achieve anything you set your mind to, through hard work, persistence, patience and determination. Of course, the most important thing about dividend investing is to get started. You do not need a lot of money to get started with dividend investing. One should never despise the days of small beginnings, and think that they need a large pike of cash before starting dividend investing. If you start slowly, even with an investment of a few dollars, you are years ahead of most other individuals. Unless you are drowning in debt, you do not have any excuse to avoid investing in some of the strongest dividend paying blue chips today. With brokerages like Robinhood, it is possible to purchase shares in companies you like without paying any commission. Of course, you should increase the amounts you put to work for you as your level of income increases over time. Otherwise, you would need to spend a higher amount of time working prior to accumulating a sufficient nest egg. So back in May 2008, my young friend opened an account with Sharebuilder with $40 that he had to his name. He paid a steep $4 commission, but managed to purchase 1.4196 shares of Realty Income (O) at 25.36/share. Being a poor college student, he was low on cash so he took advantage of a brokerage deal at Sharebuilder. As part of the deal, he received a $50 cash bonus for opening an account and making one investment. So after he made the investment, he essentially started playing with the house’s money, as he had no funds at risk after the rebate. The next smartest thing this investor accomplished was selecting the "reinvest dividends" button at Sharebuilder. This meant that the first distribution of 20 cents that he received was immediately reinvested at a fractional share of Realty Income (O). That was 0.0084 shares to be exact. His latest distribution was 52 cents, which purchased 0.0101 shares. All in all, the investor’s number of shares has risen to 2.3762 shares by March 2018. He selected Realty Income because he liked the fact that it was a dividend achiever, which had raised distributions for 14 years in a row in 2008. The payout ratio was adequate, and there was possibility of further dividends growth down the road fueled by acquisitions and rent increases over time. The beauty of dividend reinvestment is that it forces the investor to allocate cash back into the same security that paid it, through thick and thin. This eliminates emotion out of investing, and enables the investor to buy when prices are low, without second guessing themselves. The power of compounding is further magnified, when distributions are received monthly, rather than quarterly or annually. That way, distributions are put to work for you much faster, and you end up taking of advantage of time in the market to a fuller extent. The other advantage was that dividend payments were increased regularly between 2008 and 2018, which further turbocharged the compounding process. This was a rarity among REITs, many of which had to cut or eliminate distributions to shareholders during the Financial Crisis. The monthly dividend was increased from $0.137375/share in May 2008 to $0.2195/share by March 2018 for Realty Income. 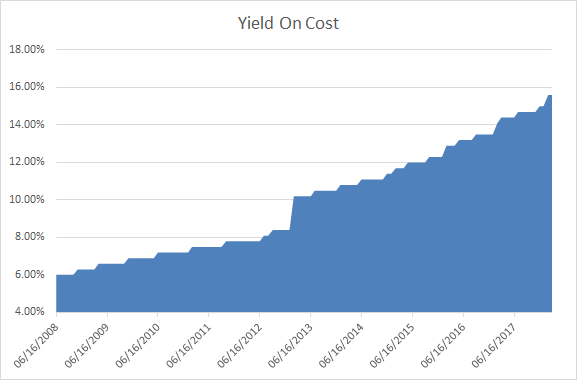 The high dividend yield from Realty Income of 6% in 2008 was also helpful in reaching to 15.60% yield on cost in ten years. If you start with a high dividend initially, which is sustainable, and you reinvest this growing distribution monthly, you are turbocharging your dividend income growth exponentially. If you earn $60 on a $1000 investment, and you reinvest dividends at 6% without any growth, your dividend income is destined to double in 12 years, using the rule of 72. To put it in perspective, if my friend had invested a mere $4,000 in Realty Income a decade ago, they would be earning over $624 in annual dividend income today. This is $50 per month in dividends without any additional input besides the capital provided a decade ago, invested in a good investment. However, the important thing is to not just focus on yield alone, but on the growth of the dividend payments. This is because during retirement, you will need to spend all of that dividend income on daily expenditures. Therefore, having your dividends increase above the rate of inflation is absolutely essential for you to maintain your standard of living. As a result, in my portfolio I have some high yielding stocks with lower growth, and some low yielding stocks with high dividend growth rates. However, the majority of my portfolio is in companies in the sweet spot, which have average yields ( around 3%) and average dividend growth rates ( around 7%). Long-term investing is a marathon, not a sprint, so you need to search for assets that will provide high inflation adjusted growth for 2 - 3 decades in the future at the minimum. The other lesson to learn is that this investment was not diversified at all. If our investor had put their money in American Capital Strategies (ACAS) in 2008, rather than Realty Income, they would not have benefited from the power of compounding. This is because American Capital Strategies eliminated distributions in 2008. Therefore, it is important to spread risk between at least 30 – 40 quality securities that have dividend growth potential. That way, if one or two of them cut or eliminate dividends, your overall portfolio income will not decline, but might even increase due to the dividend growth from the remaining components. The lessons that this young investor learned, after watching a small amount of money compound for years, were worth every single penny. Based on the experience, the investor has been ultimately able to apply lessons learned in his investing for his future goals. As he got jobs after college, and earned promotions, he was able to put increasing amounts of funds to work. It would likely take him at least 2 decades before his dividend income becomes substantial enough for his level of spending, but luckily he is on the right plan to success. Investing $40 is not much different than investing $4,000 or $40,000 or $400,000, if you have the right attitude and you focus on learning the correct process for achieving your goals. The difference is that you can easily replace $40, but $40,000 or $400,000 would take a long period of time to replace. Therefore, you need to spend the time and learn the right lessons early on, and then use this knowledge as your means increase over time. If you learn how to avoid doing dumb things to your portfolio, you would have dramatically increased your chances of achieving your goals one day.